Some legal systems, influenced in part by the doctrine separability (according to which a contractual arbitration clause is, conceptually, treated as a contract separate and independent from the matrix contract) and article V.1.a of the New York Convention of 1958, take the view that, in the absence of an express choice by the parties of the law applicable to the arbitration clause, the law of the seat should govern questions of material validity. English law, however, has never taken this view – although, arguably, the Court of Appeal came close to doing so in C v D  EWCA Civ 1282. Instead, the English courts have applied the traditional, three-stage proper law doctrine, according to which: (i) a contract is governed by the law expressly chosen by the parties; (ii) in the absence of an express choice, a contract is governed by the law impliedly chosen by the parties; (iii) in the absence of party choice (either express or implied), a contract is governed by the system of law with which it has its most real and substantial connection. Given that, in practice, it is rare for contracting parties expressly to select a law to govern their arbitration clause (as opposed to the contract as a whole), much of the debate centres on the second and third stages of the three-stage test and the relationship between them. In Sul America v Enesa Engenharia  EWCA Civ 638, parties to an insurance contract had chosen Brazilian law to govern the contract and had also agreed that disputes were to be referred to arbitration, with England as the seat of arbitration. In the context of an application to the English court by one of the parties for an anti-suit injunction (to restrain the other party from pursuing litigation in Brazil), a question arose as to which law governed the material validity of the parties’ arbitration clause. Whereas the clause was valid under English law, it was ineffective under Brazilian law unless both parties renewed their consent to it after the dispute had arisen. The Court of Appeal held that the arbitration clause was governed by English law and was binding on the parties. Accordingly, the appeal against the grant of an anti-suit injunction was dismissed. The Court accepted that, at the second stage, there is a rebuttable presumption that, if the parties expressly agree on the law to govern the matrix contract, the same law applies to the arbitration clause. However, such a presumption yields to indications to the contrary and, on the facts of Sul America, the presumption was rebutted on the basis that it was not appropriate to imply that the parties chose a law which would render their arbitration agreement ineffective. As the parties had not chosen a governing law, the arbitration clause was governed by the law of the country with which it was most closely connected – ie, English law, the law of the seat. Although the three-stage test is followed by other common law jurisdictions, the Singapore High Court applied the second stage of the test in a rather different way in FirstLink Investments Corp Ltd v GT Payment Pte Ltd  SGHCR 12. In this case, the judge questioned the English Court of Appeal’s acceptance that, as a general rule, the law chosen to govern the matrix contract also, by implication, applies to the arbitration clause. Rather, the judge considered that, at the second stage, a choice of the law of the seat should be implied. This conclusion was founded on the notion of separability and the view that, as the arbitration relationship normally only comes into play when the substantive relationship has already irretrievably broken down, there is no natural implication that commercial parties would want the law governing the substantive contract also to govern the arbitration clause. The divergence between Sul America and FirstLink has been the subject of academic comment (see Nazzini, ‘The law applicable to the arbitration agreement: towards transnational principles’ (2016) 65 ICLQ 681). More significantly, in the recent case of BCY v BCZ  SGHC 249 the Singapore High Court declined to follow FirstLink and held (obiter) that the Sul America decision is to be preferred. According to Steven Chong J, the presumption that the implied choice of law for the arbitration agreement is likely to be the same as the expressly chosen law of the matrix contract is supported by the weight of authority and is preferable as a matter of principle: in a case involving an arbitration clause forming part of a wider substantive contract, it is reasonable to assume that the contracting parties intend their entire relationship to be governed by the same law. 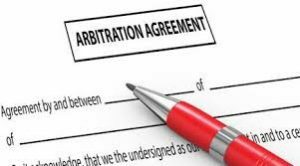 Accordingly, the law chosen to govern the matrix contract is a strong indicator of the law governing the arbitration clause within it – unless there are indications to the contrary. The choice of a seat different from the country whose law governs the matrix contract is not in itself a sufficient contra-indication. There may frequently be an air of unreality about the concept of an implied choice. If the parties fail to make an express choice of the law to govern an arbitration clause, is it possible to say with any degree of certainty that the parties really intended either the law chosen to govern the matrix contract or the law of the seat to apply? As the cases show, an argument can be put for either possibility. By the same token, it is just as likely that the parties never applied their minds to the question, meaning that the notion that the parties made an implied choice is built on a very flimsy foundation. Accordingly, if the parties’ true intentions are meant to be the determining factor, the application of the law governing the matrix contract seems no less arbitrary than the application of the law of the seat. Nevertheless, in policy terms, there is much to be said for the analysis adopted in Sul America and followed in BCY v BCZ. Where parties have clearly entered into a contract which includes an arbitration clause, the clause should be held to be invalid in only the clearest of cases. Some legal systems have reflected this policy concern by adopting a choice-of-law rule which takes the form of a rule of alternative reference: under art 178.2 of the Swiss Private International Law Act 1987, for example, an arbitration clause is materially valid as long as it complies with the requirements of any of the following laws: (i) the law chosen by the parties or (ii) the law governing the object of the dispute or (iii) Swiss law (ie, the law of the seat). Even though the English courts cannot rely on a statutory rule of this type, the common law choice-of-law rule has been developed in a way that closely approximates to the Swiss ‘validation principle’: on the basis of Sul America, an arbitration clause will be regarded as materially invalid only if it is invalid under not only the law chosen to govern the matrix contract but also the law of the seat. At common law, if the clause is valid under the law chosen to govern the matrix contract, as a general rule, the clause is impliedly governed by that law; if, however, the clause is invalid under the law governing the matrix contract, the parties are treated as not having chosen a law to govern the arbitration clause, with the consequence that the law of the seat is applicable. In view of the advantages of the Sul America approach, the decision in BCY v BCZ is to be welcomed. Not only does the decision re-establish doctrinal harmony between closely-related common law systems, but it also bolsters Singapore’s position as a leading pro-arbitration jurisdiction in South East Asia.